As we all get older, it gets progressively easier to assume the role of the grumpy old man who keeps yelling at kids for playing their music too loud or for cutting across his lawn. For sports fans, the equivalent is talking about how players from the previous generations were better and/or respected the game more than today’s breed of athlete. That’s why I was somewhat surprised many years ago when Mike Schmidt made his c omments about the Steroid Era. Rather than make the easy (grumpy old man) statement epitomized by players such as Bob Feller, Schmidt admitted he likely would have used steroids, given the money players could earn and the pressure to produce the best numbers possible. It was the reasoned, deeply considered realization of a former player who, while acknowledging the emotional aspect of the controversy, was honest with himself about the choice he might have made if he played during the late ’90s. His honesty regarding steroids gives him some leeway in regards to his comments this past October regarding the signatures of today’s ballplayers. Yes, it’s easy to say that he sounded like a grumpy old man when he asked, “Since when did the signatures of today’s celebrity athletes become worse than your local physician’s scrawl on a prescription slip?” But, he had a point. 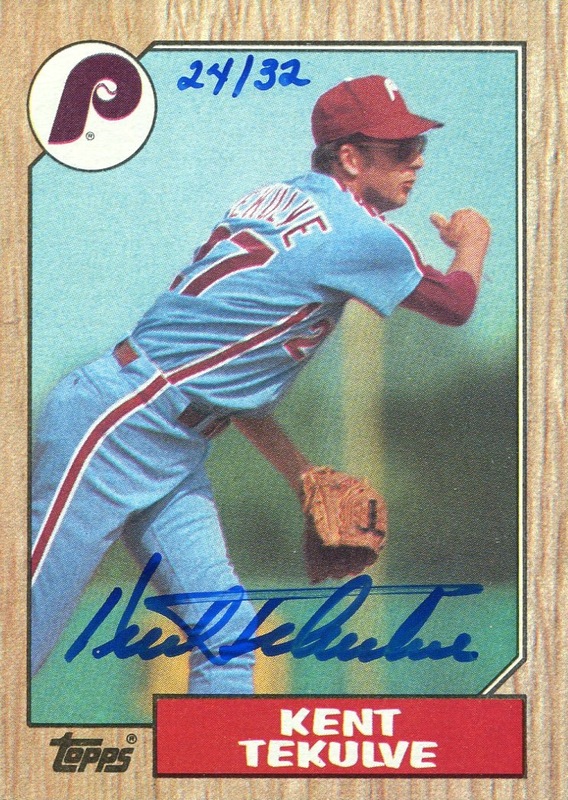 Today’s autographs are an absolute mess, and while I’ll almost certainly continue to collect Phillies autographs, I have grown frustrated with the degradation in the quality of player’s signatures, in particular, over the past 10 years. 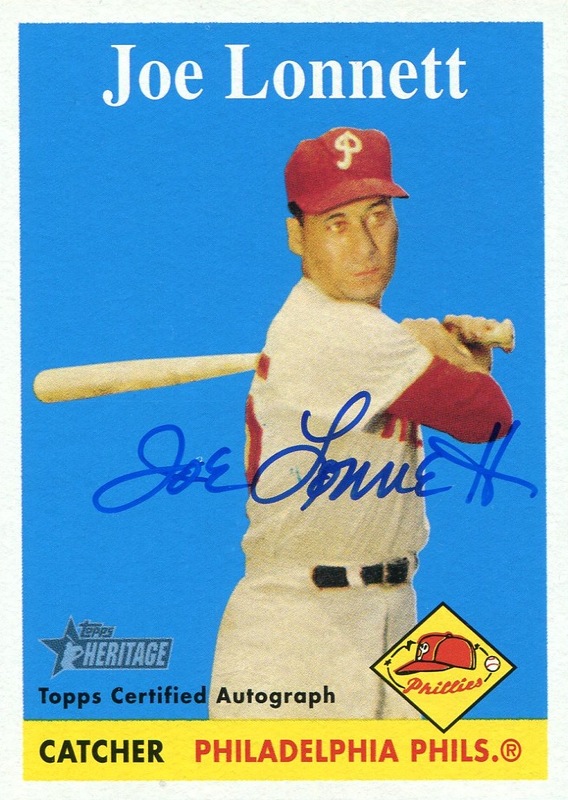 Schmidt, while discussing the specifics surrounding his question, mentioned the signatures of the athletes of his childhood, noted, “I was 12 years old in 1962. I’m looking at these cards now… I was given the autographs 50 years ago of these famous golfers and I still have them. I can read them. 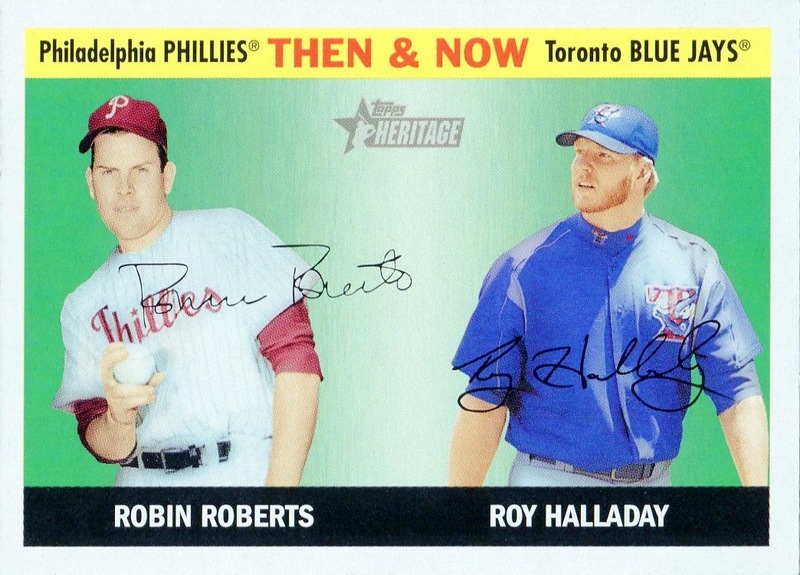 You could read them.” The same is true of the Phillies of the time — take a look at the following autographs. I’d like to note, based on the year these certified autograph cards were issued, that these men were still impressively signing in a legible manner well into their senior citizen years. 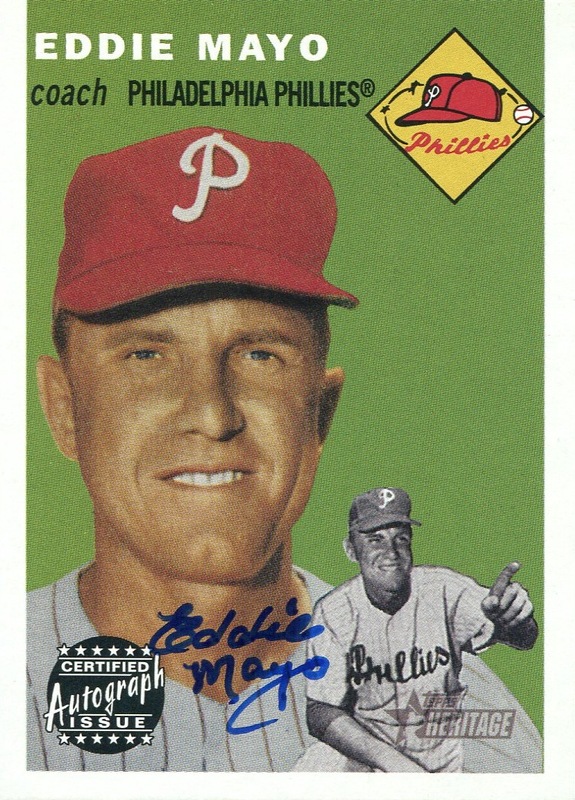 Roberts was 76 when he signed that card; Simmons, 70, Lonnett, 79; and Mayo, 89. Please take the time to remember this as you see some of the autographs later in this series of posts. 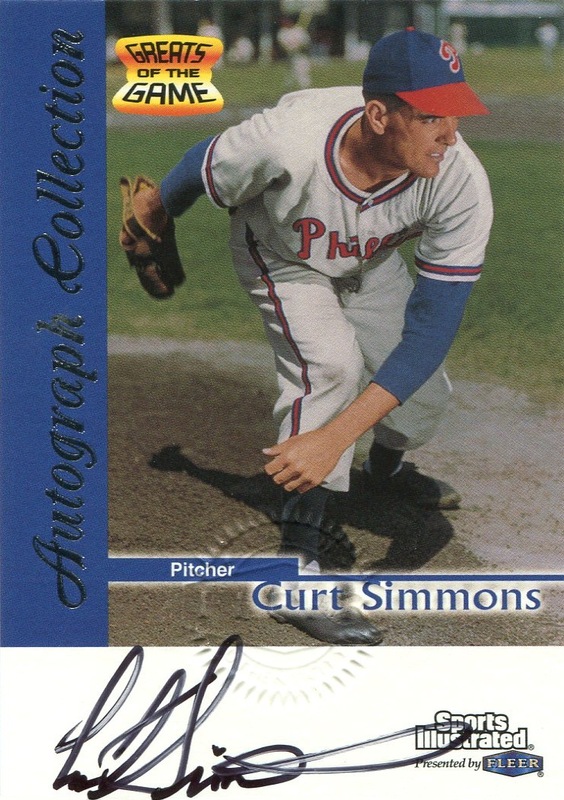 Also note that Simmons’s signature is unusually “sloppy” for players of this period, but it’s still recognizable. Thankfully, players from that era all the way through the the ’90s were, for the most part, just as conscientious when it came to signing their names. 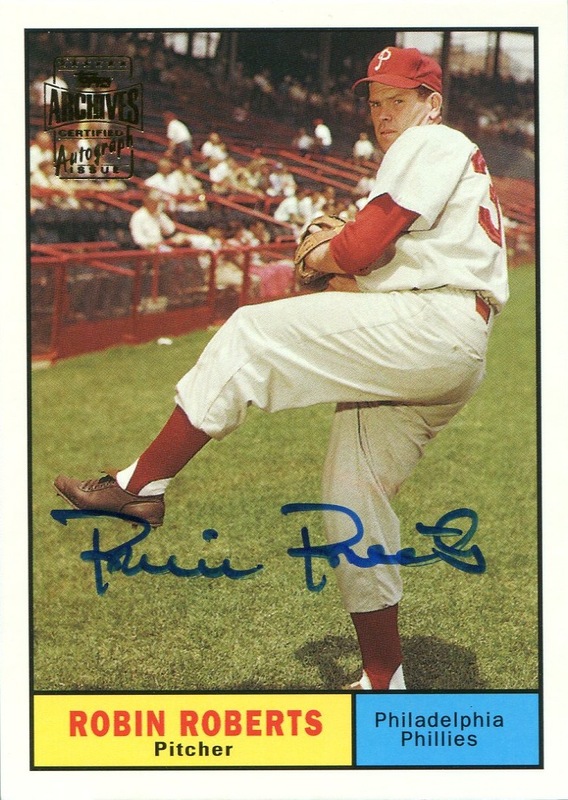 As players up through that time started taking part in certified autograph releases, it was obvious that many of them continued to take a certain amount of pride in their penmanship. 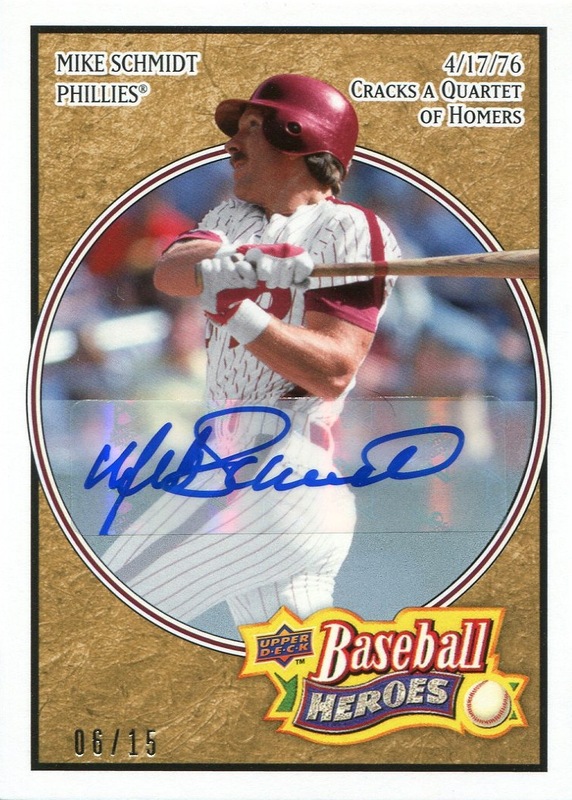 Somewhat paradoxically, however, many of them actually started signing after the rise of the certified autograph issue in the mid ’90s, which was when the noticeable decline in the quality of signatures of today’s ballplayers really began to take place. Later this week, the 1996 Leaf Signature Series sets: a harbringer of what was to come. 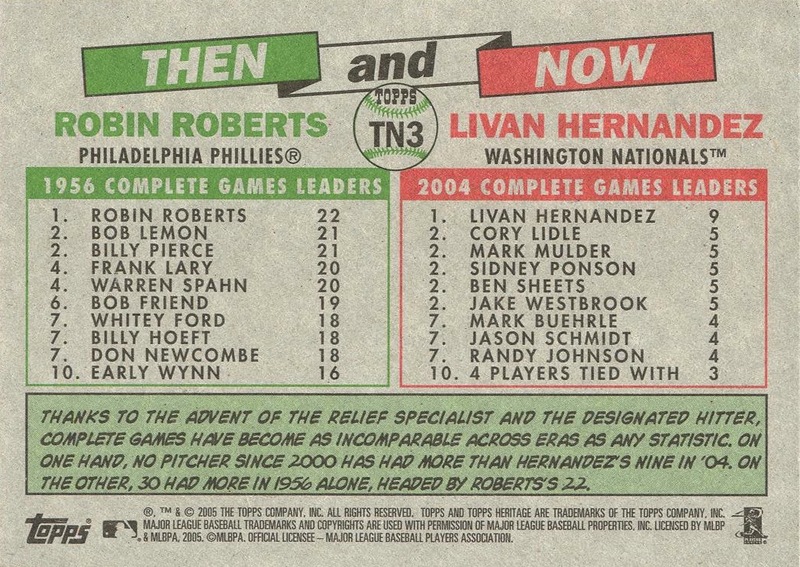 Additional Information: Inserted in packs of 2004 Topps Heritage. Additional Information: The largest, in number of cards, of the original Bowman sets. 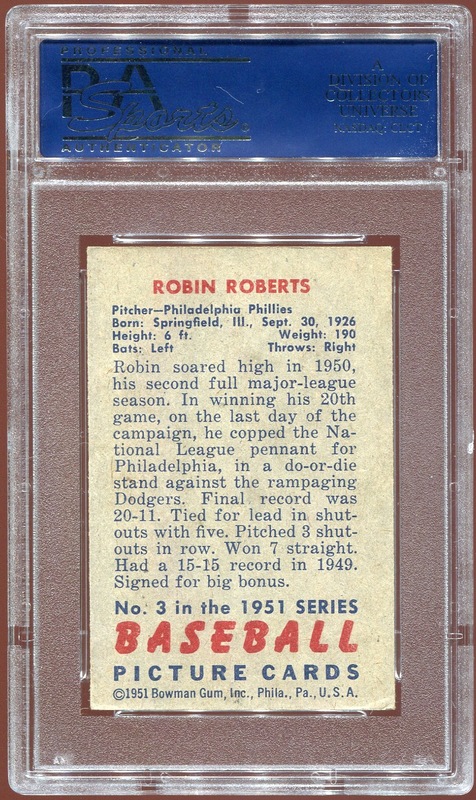 Bowman essentially reused the entire design with its 1952 offering, with the exception of replacing the black text box containing the player’s name with a facsimile picture and the use of plain black text on the back. 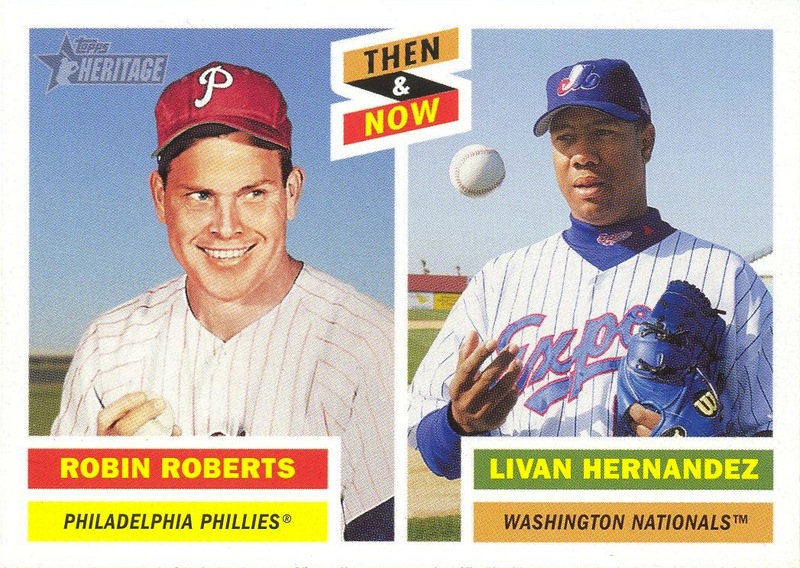 Topps replicated the design of this set when it released the 2005 Bowman Heritage set. 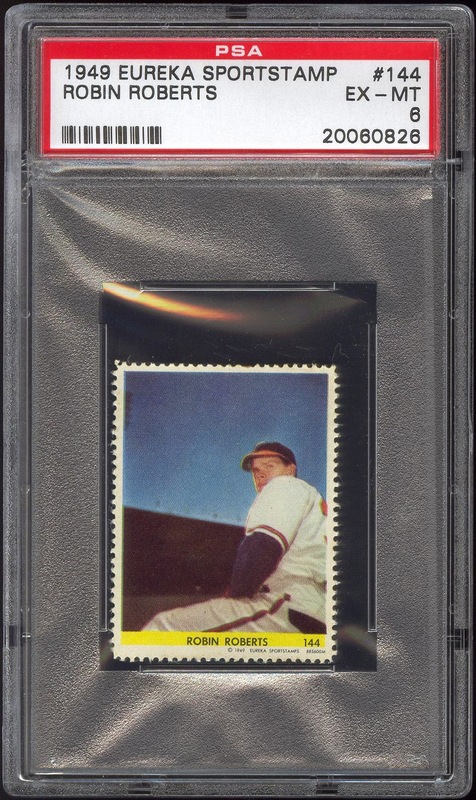 While the primary set was standard-sized, Topps also issued a parallel mini-set that used the same dimensions as the original Bowman offering. 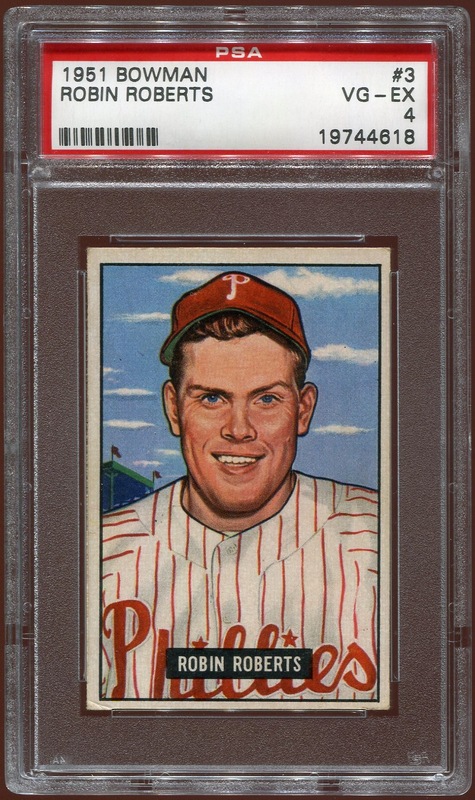 Beckett’s Phillies portion of the checklist is in error, starting with Richie Ashburn at #127 and including Sawyer at #145. 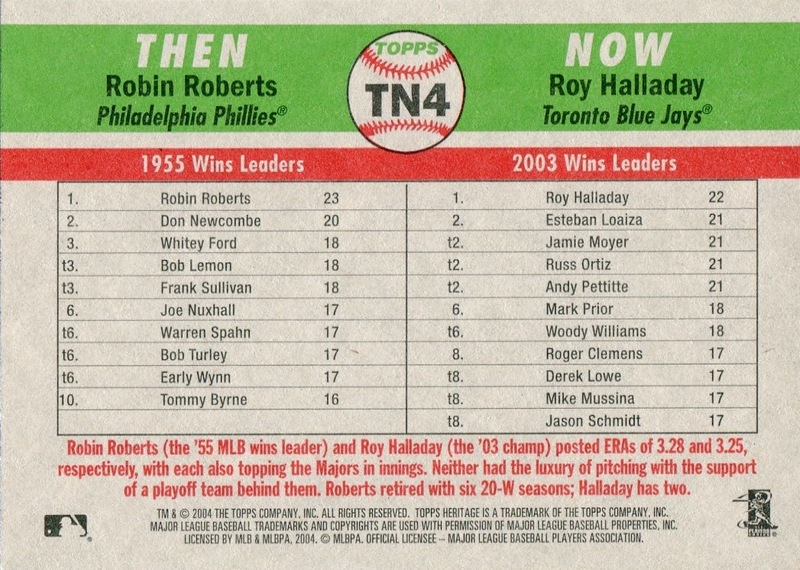 I have confirmed that the checklist printed by SCD in the Standard Catalog (the one shown below) is the correct one — as evidenced by the fact that Robin Roberts is listed as #143 in Beckett and the sample scan above clearly shows he is #144. 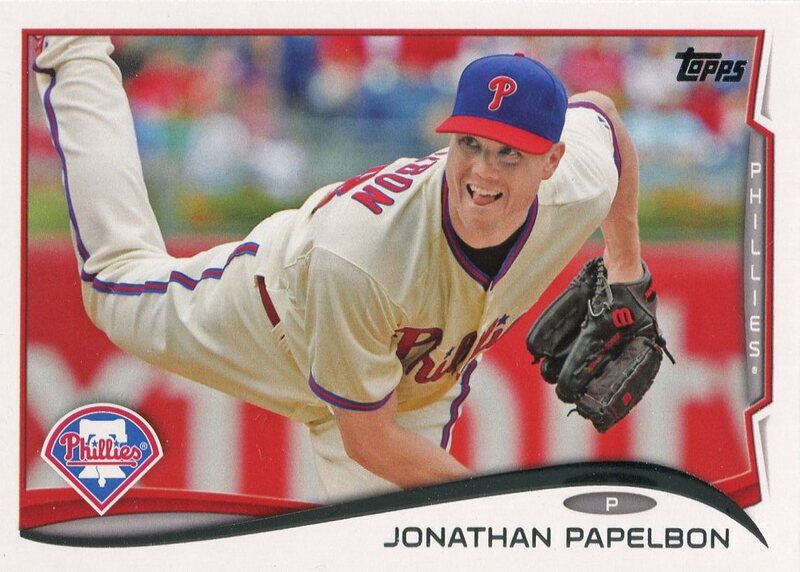 Additional Information: Inserted in packs of 2005 Topps Heritage.